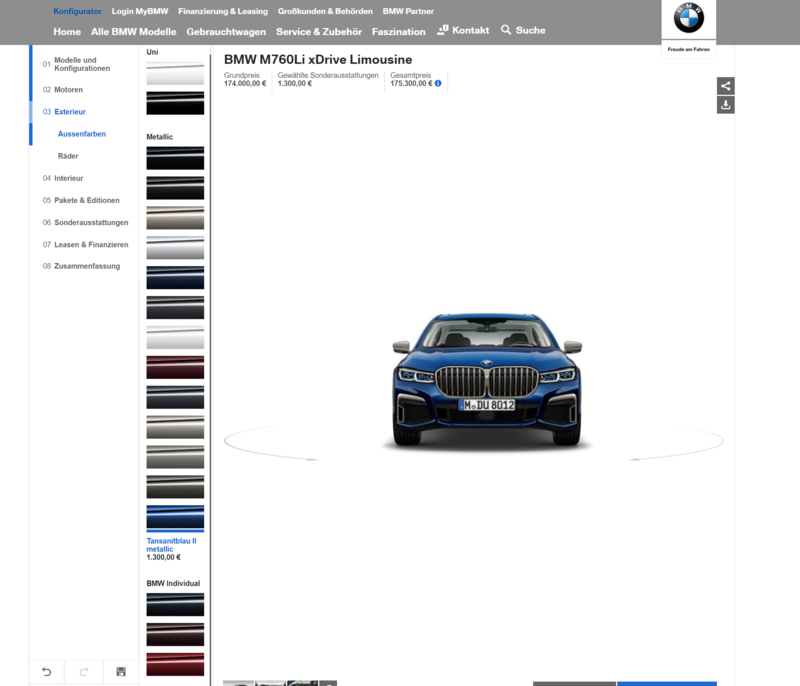 Shortly after the unveil of the new 2019 BMW 7 Series Facelift, the online configurator went live on www.bmw.de. Since the official photos skipped the M760Li model and the M Sport Package, we can now take a closer look at them. 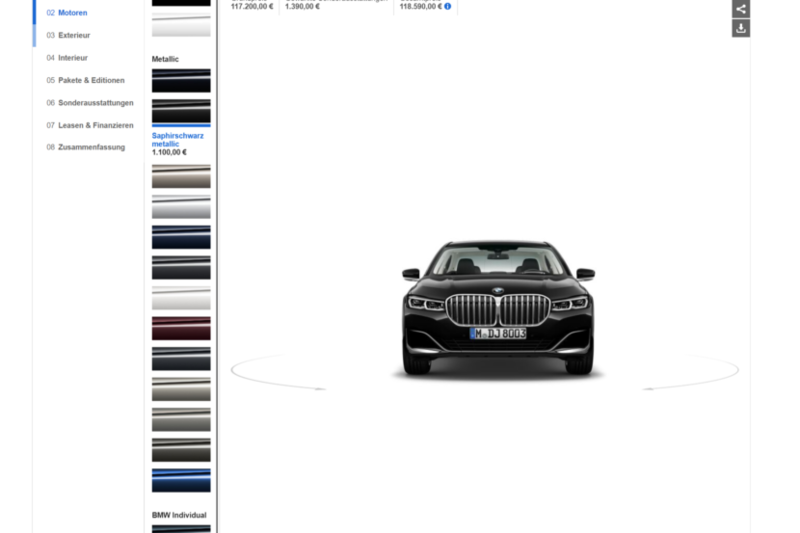 A few new colors are alsoavailable on the 7 Series; Bernina Grey Amber Effect Metallic, Royal Burgundy Red Metallic (anyone else think “Ron Burgundy for a second?) and Donington Grey Metallic. The latter of which is actually an M5 color, which is actually quite cool that you can get that on a 7er. Though, you need to select the M Sport package to get it, which kind of makes sense. 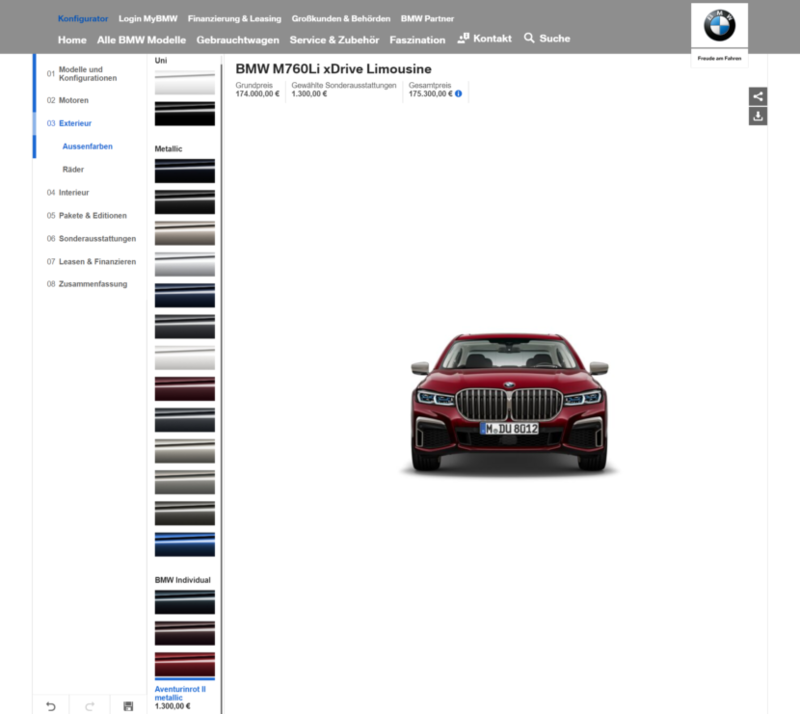 Customers can also choose from four selected BMW Individual paint options, including the new shades Dravit Grey metallic, Tanzanite Blue II metallic and Aventurin Red metallic which replace outgoing Ruby Black metallic, Moonstone Metallic and Almandine Brown metallic. Azurite Black metallic joins the new Individual paints as a carry-over. Compared to the US market, in Europe, there will be three diesel engines available, all of them 3.0 liter turbocharged inline-sixes. Though, their turbocharger counts vary. The BMW 730d gets a single turbocharger and 265 hp, the 740d gets two turbochargers and 320 hp while the big boss 750d gets four turbochargers and 400 hp. All of them come in “L” long wheelbase models and all of them are available with xDrive all-wheel drive. Replacing the BMW 740e is the new BMW 745e xDrive, which now has a 3.0 liter turbocharged I6 engine, rather than the old 2.0 liter four-pot. That new six-cylinder engine makes 280 hp and the electric motor paired to it makes 113 hp. Maximum total power output for the 745e is 389 hp and 442 lb-ft of torque, much more than the outgoing model. As expected, the most expensive European model is the M760Li which starts at 174,000 Euros but with several options and Individual customizations, we can see it jumping over the 200,000 Euros mark. The most affordable European model is the 730d which is priced at 88,400 Euros.